How to make spicy Korean chicken stew with potatoes, tender chicken pieces and potatoes coated in a spicy sauce made with Gochujang paste. 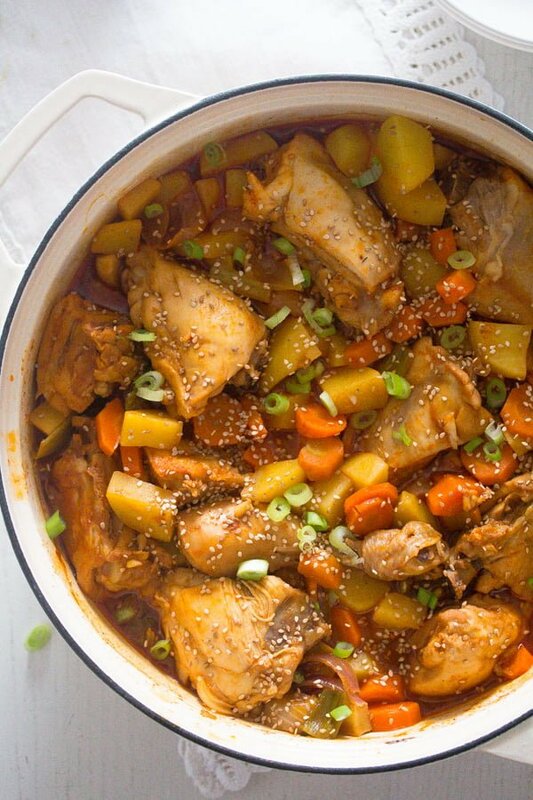 This Korean chicken stew recipe has become one of my favorite chicken dishes lately. I have already cooked this dish several times, it is just that good. A very straightforward recipe, no special techniques or steps required, just a few good ingredients and a minimum of effort. And the result is absolutely mouthwatering. You will not believe how tender those chicken thighs will become, how good that sauce will be and how you will lick every leftover sauce from the bottom of your pan after being finished with the chicken and the potatoes. 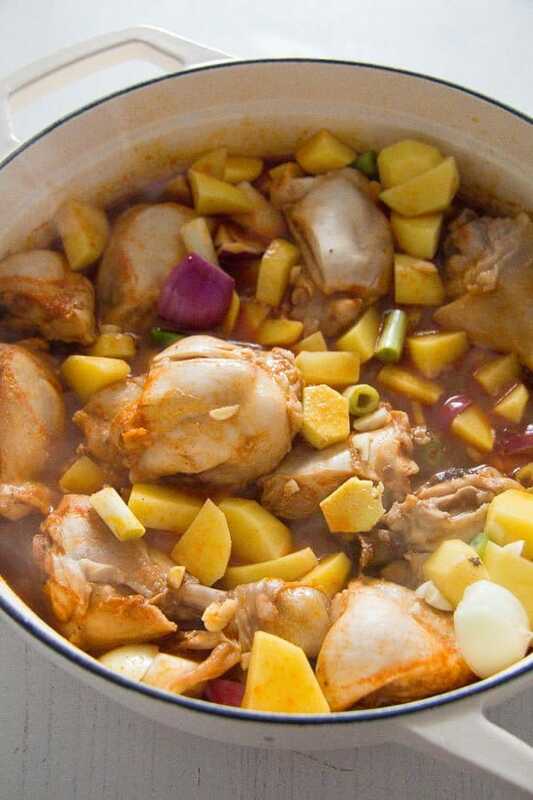 And the best thing about this Korean chicken stew with potatoes, if you ask me, is that I get to taste something so different from the food I usually eat without having to spend lots of money on ingredients that are not available here or having to learn special cooking techniques. These are problems I always encounter when trying to cook Thai food, for instance, so delicious but quite a challenge to cook in a kitchen in the middle of Germany, far away from any larger city. I make one stew or another many times, my blog is full with stew recipes. But they are mostly Romanian stews, because Romanian people like me just love food served in form of a stew. 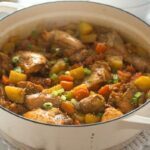 Just have a look at this Romanian chicken paprikash with dumplings, this chicken and pea stew or this easy potato stew, for instance. 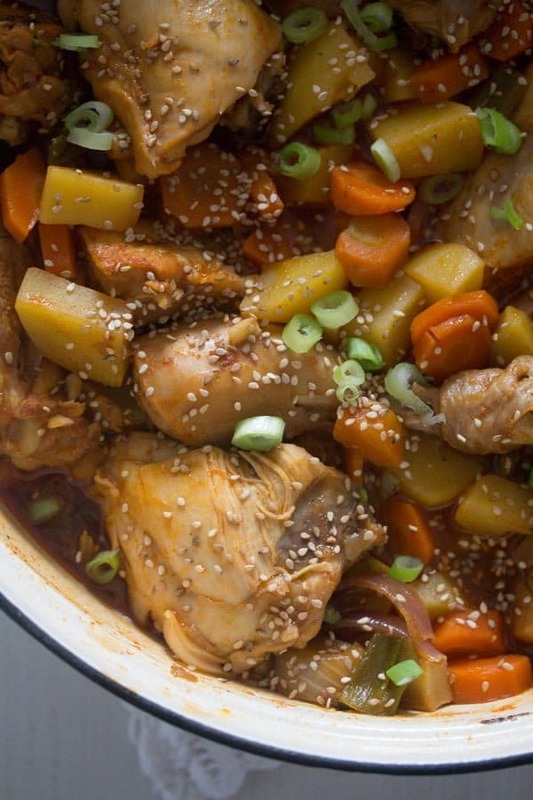 So cooking this Korean chicken stew was both familiar and different. Completely different taste, although so similar to a regular Romanian or European style stew. But the spices make all the difference. First of all, you will need some chicken. You can use a whole chicken and cut that into 8 parts. Or you could use just chicken legs like I did, either thighs or drumsticks or rather a mixture of the two. I don’t often skin the chicken when cooking it, but I do that most of the times when cooking a stew. I like chicken skin a lot when it is crispy and spicy, but I absolutely hate it when it is soft and floppy and that’s the way it will become in a stew, when braised almost immersed in a lot of sauce. But the skinning of the chicken legs is optional, do as you like. I do recommend removing the skin, but that is just personal preference. Read the end of the blog post to find out how you can use the skin of the chicken. Another important ingredient, the only one which might require an Asian store (or the internet) in order to buy it, is the Korean Gochujang paste. The Korean Gochujang paste is a fermented condiment – hot pepper paste – containing chili powder, glutinous rice, fermented soybeans and salt. It comes in several heat degrees, so you might want to pay attention to that when purchasing gochujang paste. I used a medium Gochujang paste, which is so hot it makes me wonder how hot the hot paste is… Probably unbearable for me. I bought this paste to make the Korean chicken wings and the oven baked chicken drumsticks with honey I posted in summer and I still have some, it keeps well in the fridge and I can never use as much as required in a recipe, it is just too much. So, because I use it so economically, I still have some to use for other recipes as well. The rest of the ingredients are pretty basic and easy to find just about anywhere. In case you cannot find or want to buy a bottle of rice vinegar, you can use cider vinegar instead, cider vinegar is a pretty mild flavored vinegar that will not overpower the dish. Step 1: Mix the wet ingredients (water, soy sauce, vinegar) in a wide and not too tall a thick bottomed pot or Dutch oven, a pot large enough to hold all the chicken pieces in a single layer. Whisk in the Gochujang paste and the honey, add the chili flakes and the pepper. Step 2: Skin the chicken pieces (if desired) and place the chicken in the pot. Bring to a boil, reduce heat to medium and simmer, covered, for about 15 minutes. Step 3: Add the chopped vegetables (potatoes, onion, carrots, garlic and ginger), stir well, cover again and cook for further 15 minutes or until the potatoes are tender. Step 4: Remove the lid and continue cooking for about 10 minutes or until the chicken is cooked through and the sauce is slightly thickened. If you like your sauce to be thicker, you can thicken it with a small amount of corn starch slurry (1 tablespoons corn starch mixed with 1-2 tablespoons cold water to form a runny thick paste, which will be whisked into the boiling sauce). Step 5: Stir in the sesame oil, check the seasoning and sprinkle the chicken stew with chopped scallions and toasted sesame seeds just before serving. 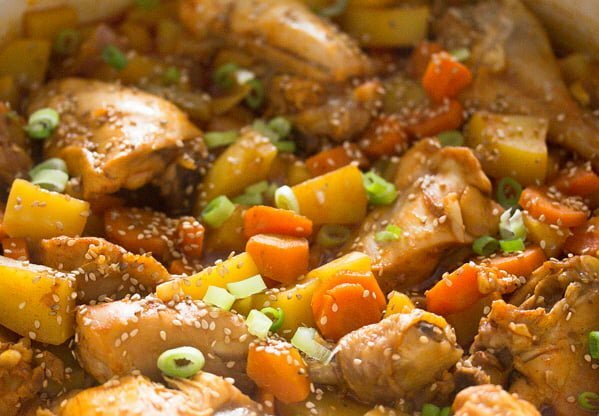 We served the Korean chicken and potato stew with kimchi, but a green salad with vinaigrette dressing would be great as well. 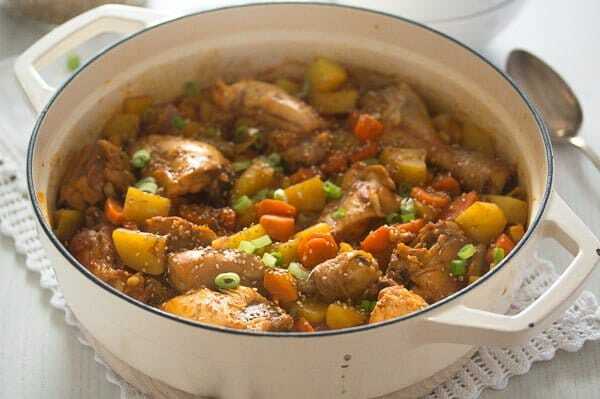 The chicken stew with potatoes reheats well. 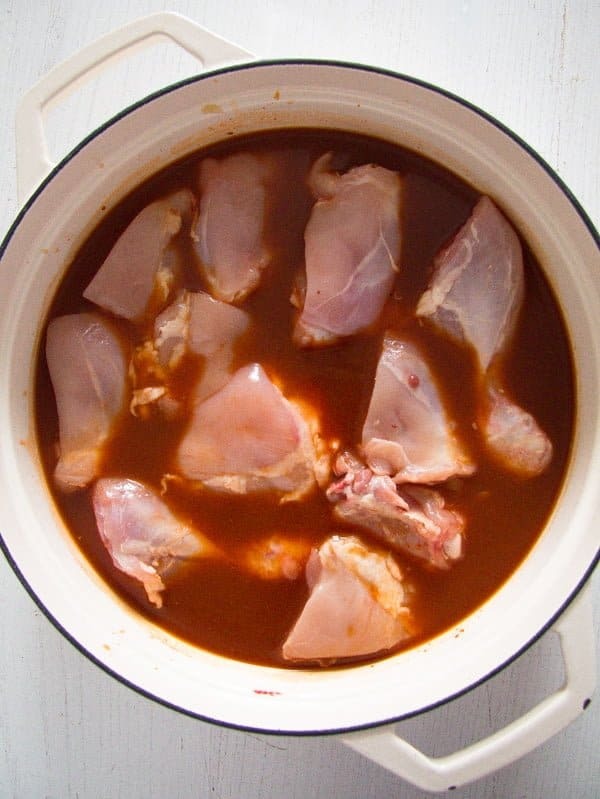 If you don’t like wasting the skin of the chicken, you can cut it into small pieces and render their fat in a small pot. Give the finely chopped skin to a small thick bottomed pot or saucepan and render the fat on very low heat, until the skin pieces are golden and crispy and the fat surrounds them. Strain the fat through a small sieve into a small jar, let cool and refrigerate. You can use the rendered fat instead of oil or butter when cooking and you can even smear it thinly on fresh bread, sprinkle it with salt and enjoy it as it is, this kind of bread with rendered fat (mostly pork) was more common in the Communist days in Romania than butter, and definitely healthier and better tasting than margarine. Give the crispy skin pieces onto kitchen paper, which will absorb the extra fat, salt them and enjoy them very fresh, either on top of the chicken stew, on a salad or just like that. They are best eaten fresh, they become soft after a while. 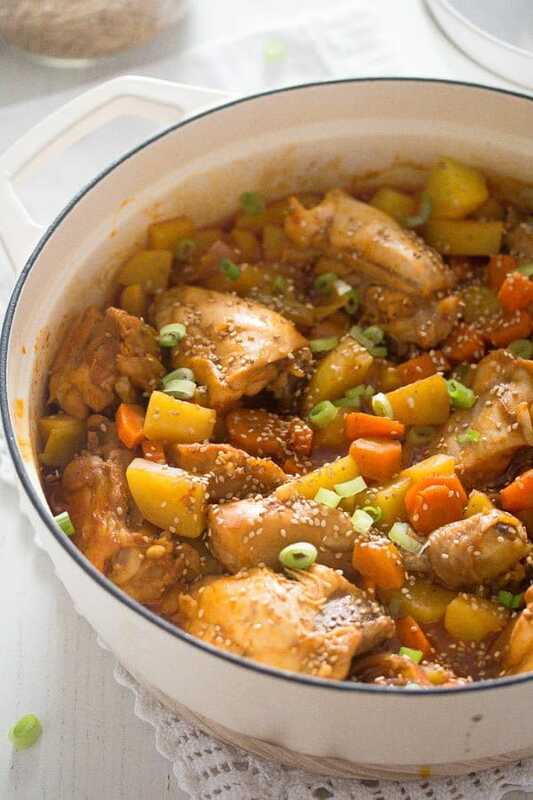 Take a wide, thick bottomed pot or Dutch oven that will hold all the chicken pieces in one single layer. Give the water, soy sauce, rice vinegar, Gochujang paste, honey and pepper to the pot and whisk well. Skin the chicken pieces and arrange them in the pot in a single layer. Bring to a boil, reduce heat to medium and simmer, covered, for about 15 minutes. In the meantime, peel and chop the potatoes into large chunks. Cut the carrots and the onion into chunks as well. Peel the garlic cloves and chop them finely. Peel and grate the ginger. Give the prepared vegetable to the chicken sauce and stir to make sure that they are all mixed in the sauce. Cover again and cook for further 15 minutes or until the potatoes are tender. Remove the lid from the pot and continue cooking for about 10 minutes until the chicken is cooked through and the sauce is slightly thickened. If you like your sauce to be thicker, you can thicken it with a small amount of corn starch slurry. Mix 1 tablespoons corn starch with 1-2 tablespoons cold water to form a thicker yet still runny paste. Whisk this slurry into the boiling sauce, let bubble shortly and remove the pot from the heat. Stir in the sesame oil, check the seasoning and sprinkle the chicken stew with chopped scallions and toasted sesame seeds just before serving. Note 1: Cider vinegar can be used instead. Note 2: Use Gochujang paste according to taste. My paste is medium, yet so hot I cannot use more than one tablespoon if I want the kids to be able to eat with us. Note 3: You will only need the corn starch slurry (made with corn starch and water) if you desire your sauce to be thicker. Otherwise, you can leave this step out. This would be really nice with some parsley rice! This is definitely one of my favorite. Gochujang paste is very versatile. Very similar to Chinese fermented bean paste, if not the same! 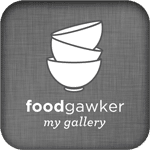 IMO – Korean Gochujang paste is the best chile paste out there. 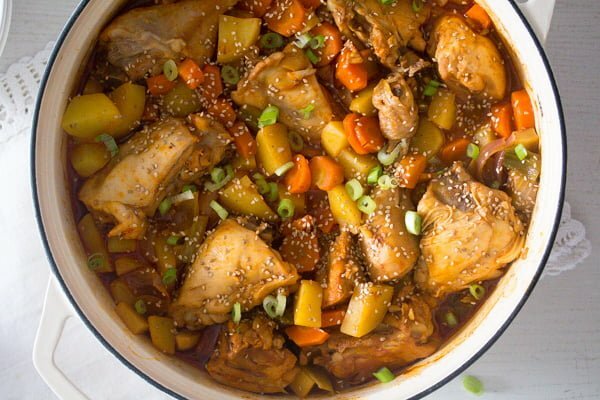 I put it on everything and because of that I know that this chicken stew could easily become a favorite. It looks quite hearty and very delicious! Adina, this stew looks so cozy and homey. Love the Korean flavors in it. I’ll look for the Gochujang paste in my local Korean market. I’d love to wrap up in a cozy blanket and eat a big bowl of it right about now!